While covering your webcam could be a definite strategy to keep away webcam hackers, but what would you do if come to know that someone may be watching your every move or listening to your every word while you are using a webcam microphone. Scary, isn’t it? A team of researchers has discovered that hackers can remotely spy on a computer screen by listening in with a microphone. The hacker can listen to acoustic noises coming from within computer screens and can be used to detect the content displayed on the screens. In other words, anyone with good technical knowledge knows-how can easily snoop on someone’s computer activities. The side-channel attack dubbed as “Synesthesia” by the researchers can reveal the contents of a remote screen, providing access to potentially sensitive information based only on “content-dependent acoustic leakage from LCD screens.” LCD screens with both CCFL and LED backlighting are affected. 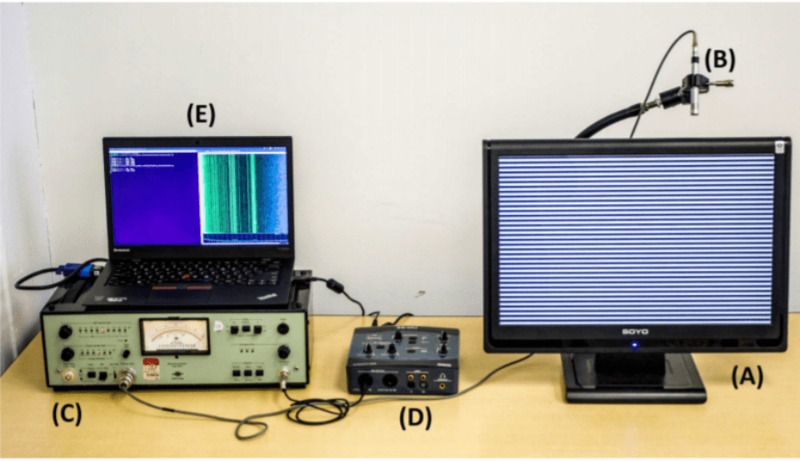 According to the researchers, the subtle acoustic noises can be picked up by ordinary microphones built into webcams or screens, or even by a smartphone or “smart speaker” placed on a desk next to the screen, or from as far as 10 meters away using a parabolic microphone, or over an attached webcam microphone during a Skype, Google Hangouts, or other streaming audio chat, or through recordings from a nearby device, such as a Google Home or Amazon Echo. “The pertinent sounds are so faint and high-pitched that they are well-nigh inaudible to the human ear, and thus (unlike with mechanical peripherals) users have no reason to suspect that these emanations exist and that information about their screen content is being conveyed to anyone who receives the audio stream, or even a retroactive recording,” according to the study. The researchers created an experimental setup that attempted to recognize simple, repetitive patterns. “We created a simple program that displays patterns of alternating horizontal black and white stripes of equal thickness (in pixels), which we shall refer to as Zebras. The period of a Zebra is the distance, in pixels, between two adjacent black stripes,” the researchers recounted in their paper. As the program ran, the team recorded the sound emitted by a Soyo DYLM2086 screen while displaying different such Zebras. With each different period of stripes, the frequency of the ultrasonic noise shifted in a predictable manner. With the help of specially-trained machine learning algorithm, the researchers were able to then translate the recordings. The team was also able to identify which of the 10 most popular websites were displayed on a monitor with 96.5 percent accuracy. The study was carried out by researchers from the University of Michigan, University of Pennsylvania and Tel Aviv University. You can read all the details about the study here.